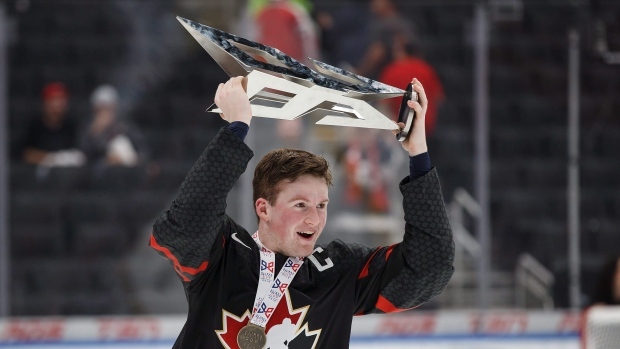 EDMONTON — Canada has captured yet another gold medal at the under-18 level. Sasha Mutala and Alexis Lafreniere each had a pair of goals as Canada defeated Sweden 6-2 in the final of the Hlinka Gretzky Cup on Saturday night. Kirby Dach and Josh Williams also scored for Canada, which has now won the tournament 10 of the last 11 years, and has earned gold 22 times in the event's 28-year history. "We just stayed focused on our game plan," Lafreniere said. "They scored two quick goals, but we kept working. Good things will happen. It was really clutch that we scored two quick goals." Canada was fortunate to be in the final after scoring a game-tying goal at the buzzer against the United States in the semis that likely would have been called back if video replay was allowed. Canada went on to win 6-5 in overtime. Against Sweden, Canada faced an early deficit. Sweden scored just 42 seconds into the first period on a power play as Raymond rifled a shot top corner past Canadian goalie Nolan Maier. Sweden took a 2-0 lead with eight-and-a-half minutes remaining as Holtz beat Maier on a breakaway, prompting Canada to make a goalie change, with Taylor Gauthier coming into the game. "When he came in, he brought a lot of confidence to our team with his energy in the net," Tourigny said. "He made a few key saves in the second period that were game-breakers for us." The move seemed to give the Canadians some life as they got on the board just 41 seconds later when Mutala tipped a puck past Swedish goaltender Hugo Alnefelt. A couple minutes later Canada knotted the game up as 2020 first overall draft pick favourite Lafreniere stole a puck and sent it on net, where it was redirected in by Dach. NOTES: It was the first year the tournament was hosted by Edmonton, which will have it every second year for the next four years, with the odd years taking place in the Czech Republic and Slovakia … Last year's Hlinka tournament produced 77 players who went on to go in the 2018 NHL draft, including seven of the top 10.